News Update-Medical Equipment,Surgical Instruments & Hospital Technology related News. Mail us your Press Releases for FREE Publication ! 19th Medi Pharm Expo, an International Medical, Hospital & Pharmaceutical Exhibition in Ho Chi Minh City (HCMC), Vietnam at Saigon Exhibition & Convention Centre from August 1-3, 2019. India Trade Promotion Organization (ITPO) under Ministry of Commerce & Industry will organise India Pavilion in 19th Medi Pharm Expo, an International Medical, Hospital & Pharmaceutical Exhibition in Ho Chi Minh City (HCMC), Vietnam at Saigon Exhibition & Convention Centre from August 1-3, 2019. It is one of the most prestigious specialised exhibitions in Healthcare Industry, endorsed & supported by Ministry of Health of Vietnam & all relevant medical & Pharmaceutical Manufacturers Associations in Vietnam. Vietnam has been an emerging attractive destination for foreign investors, particularly the pharmacy and medical equipment companies. The demand for medical equipment is on rise especially hi-tech equipments for hospitals in big cities including Ho Chi Minh City. The fair will provide excellent opportunity for branding, meeting customers/importers, and officials from hospitals of various provinces. Hospital Equipment : Medical equipments, instruments, machines & materials used in hospitals, Exmination & treatment services, community healthcare consultancy for Hospitals, medical centres, clinics, sanatoriums and Medical Tourism. Pharmaceutical Products & Process Machinery. Medipharm Expo promotes trade activities catering to entire segment of health & medical equipment strengthening local & B2B operation. Expansion of themes around rehabilitation and care met with broad approval. Medical Fair India proved to be in top shape for its 25th anniversary with a record number of over 600 exhibitors including Narang Medical Limited, from 25 countries and over 15,000 visitors. Medical Fair India is the leading trade fair for the Indian healthcare industry which took place from 21 to 23 February 2019 in New Delhi (Pragati Maidan). This signifies an increase in visitors compared to both last year's event in Mumbai (12,350 ) as well as the event in New Delhi in 2017 (13,480). Once again, the event's supporting program contributed to the success of Medical Fair India 2019. Here, we find established elements such as the CLIN LAB INDIA, organized in cooperation with Scherago (USA) and Health Care Events (India), a conference with an exhibitor area on trending topics in laboratory medicine as well as the two-day conference Voice of Healthcare. Here, the popular sessions looked at current technology trends and aspects of international cooperation with manufacturers and institutions, among other topics. One of the highlights was the anniversary gala on 22 February, at which a big announcement was made: With the FAMDENT shows, Messe Dusseldorf India has acquired the top specialist events in the field of dentistry. These events are now members of MEDICAlliance, the umbrella brand for the Messe Dusseldorf Group's global healthcare trade fair activity. Thomas Schlitt signed an agreement to this effect on behalf of Messe Dusseldorf India, as did Dr. Anil Arora and Dr. Jyotika Arora, who have organized all the FAMDENT shows. In terms of contents, the MEDICAL FAIR INDIA 2019 included the following areas and many more: Medical Products and Medical Technology, Laboratory Technology and Diagnostics, Equipment and Furniture for Clinics and Health Centres, Products for care and Rehabilitation and Health IT and Mobile health solutions. The next Medical Fair India will take place from 05 to 07 March 2020 in Mumbai (Bombay Concention & Exhibition Centre). JAPAN'S LEADING MEDICAL & ELDERLY CARE SHOW ANOTHER GREAT SUCCESS! 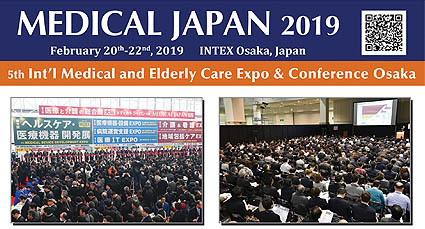 MEDICAL JAPAN 2019 - 5th Int'l Medical and Elderly Care Expo & Conference Osaka was successfully held from February 20 to 22, 2019 at INTEX Osaka, Japan. The Ribbon-cutting Ceremony was grandly held to celebrate the opening of MEDICAL JAPAN 2019. 38 ribbon-cutting dignitaries, consisting of organizers, top executives of hospitals, medical device manufacturers, governmental officials and international organizations from Japan, Korea, Hong Kong, Thailand, US, Canada and Germany were introduced. Those industry leaders expressed their commitment towards the show and further development of the industry. Consisting of specialized shows covering the entire healthcare industry, MEDICAL JAPAN 2019 Osaka gathered 782 exhibitors from 24 countries/regions and 21,663 professionals worldwide. MEDICAL JAPAN has firmly established itself as an international business platform in Japan, one of the world's leading medical markets. MEDICAL JAPAN is well-known as an international business platform in Japan. As per organizer, 782 exhibitors from 24 countries/regions and 21,663 visitors from 32 countries/regions gathered altogether under one-roof. It is the best gateway for international exhibitors to meet business partners not only from Japan, but also from Asia and other areas of the world. With an increasing number of international visitors, the show is regarded as the Asian business hub. To exchange information on Medical and Healthcare, Conference consisting of 170 sessions were organized and all the 12 venues of conference sessions were full of 10159 attendees. As per organizer, there were 13 international pavilions at MEDICAL JAPAN 2019 showcasing their countries/regions' advanced products and technologies. They gathered great attention from Japanese importers and also visitors from Asian countries. Every year, more and more pavilions bring additional excitement to the fair ground. This year, Wisconsin (USA) Pavilion, Alberta (Canada) Pavilion and Pakistan Pavilion were new comers. Many new countries/regions are expected in next edition. Next edition of Medical Japan will be coming on October 23-25, 2019 in Makuhari Messe, Japan to be organized by Reed Exhibition Japan Ltd. While Narang Medical Limited (NML) "honors" the "creativity" (though misplaced and misused) of some companies / persons in the market trying to imitate them, they see these companies / persons as players forced to copy because of having nothing original to offer. Mr. Parveen Narang, Director, Narang Medical Limited stated, "If imitation is the highest form of flattery, Narang Medical Limited is positively blushing right now"
NML strives for the best in product quality and customer service, and it is with this practice in mind that they are making this official statement regarding the unauthorized & illegal use of Narang & NET brand name. This is to inform NML’s partners that there is a sudden onslaught of unethical companies / persons trying to profit from NML’s reputation by using "Narang" in their company name, web address, and contact person name. These fake companies / persons are marketing their copious products under the banner of ‘Narang’. At NML commitment to customer safety is of the highest priority. These duplicates are putting the company’s reputation and buyer’s trust at stake. These fakes are playing with the lives of people by offering inferior quality cheap imitations of NML products with deceptively similar company name / brand / packaging etc. The key to fighting the “pandemic” of counterfeiting lies in an active collaboration between the buyers, all stakeholders and NML. It’s only through buyer’s support that NML can succeed in this endeavor. NML seeks buyer’s strong support to help them consistently adhere to their business philosophy of providing exceptional service, high quality and value. About the company: Started as a small enterprise in early 1950's, Narang Medical Limited has reached new heights and is now - India's most reputed manufacturer and exporter of NET Brand Hospital Furniture, Orthopedic Implants and Medical Equipment. NML conforms to ISO and CE standards, and is a Star Export House company certified by the Government of India.